Great location in the middle of Helsinki in a cool building! Simple hostel yet everything you need is there and is neatly taken care of. The hostel is located in a beautiful building. Everything is on walking distance and there are a lot off bars and restaurants in the area. It is really clean and the staff is warm. The beds are good just a little noisy. It is a really quite hostel and making contact with other travelers is hard. 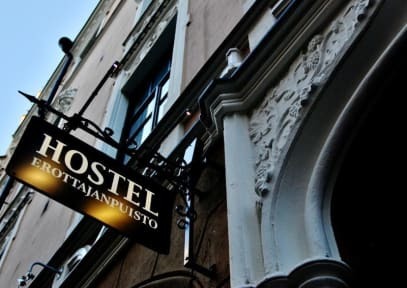 In Helsinki there aren't that many hostels, but this one is close to all major spots. The bunk beds are all bought in big blue warehouses from Sweden, so they're not that comfortable. the kitchen is the only common room, but doesn't invite you to have a nice chat with a fellow traveller. It's a beautiful building in a nice neighbourhood, so with some modifications this could be a better hostel.